disease resembles dengue fever, and is characterized by severe, sometimes persistent, joint pain (arthiritis), as well as fever and rash. It is rarely life-threatening. Chikungunya occurs in Africa, India and Southeast Asia . It is primarily found in urban /peri-urban areas. There is no specific treatment for chikungunya. Prevention centers on avoiding mosquito bites in areas where chikungunya virus may be present, and by eliminating mosquito breeding sites. Chikungunya (also known as chikungunya virus disease or chikungunya fever) is a debilitating, but non-fatal, viral illness that is spread by the bite of infected mosquitoes. It resembles dengue fever. 2. Which are the states affected by chikungunya? The states affected by chikungunya are Andhra Pradesh, Karnataka, Maharasthra, Madhya Pradesh, Tamil Nadu, Gujarat & Kerala. In the year 2006, total number of 1390322 suspected Chikungunya fever cases were reported from the country. 3. When was chikungunya epidemic outbreak occurred in the past? In India a major epidemic of Chikungunya fever was reported during the last millennium viz. ; 1963 (Kolkata), 1965 ( Pondicherry and Chennai in Tamil Nadu, Rajahmundry , Vishakapatnam and Kakinada in Andhra Pradesh; Sagar in Madhya Pradesh; and Nagpur in Maharashtra) and 1973, (Barsi in Maharashtra ). Thereafter, sporadic cases also continued to be recorded especially in Maharasthra state during 1983 and 2000. 4. What is the infectious agent that causes chikungunya? Chikungunya is caused by the chikungunya virus, which is classified in the family Togaviridae, genus Alphavirus. Chikungunya is spread by the bite of an Aedes mosquito, primarily Aedes aegypti. Humans are thought to be the major source, or reservoir, of chikungunya virus for mosquitoes. Therefore, the mosquito usually transmits the disease by biting an infected person and then biting someone else. An infected person cannot spread the infection directly to other persons (i.e. it is not a contagious disease). Aedes aegypti mosquitoes bite during the day time. 6. Where is chikungunya found? Chikungunya occurs mainly in Africa, India , and Southeast Asia . There have been a number of outbreaks (epidemics) in the Philippines and on islands throughout the Indian Ocean . Epidemics are sustained by the human-mosquito-human transmission cycle. The Aedes mosquitoes that transmit chikungunya breed in a wide variety of manmade containers which are common around human dwellings. These containers collect water, and include discarded tyres, flowerpots, old oil drums, animal water troughs, water storage vessels, and plastic food containers. Lack of public health infrastructure and all factors that promote uncontrolled mosquito breeding are conducive to outbreaks of chikungunya, or other mosquito borne diseases. 7. What are the symptoms of chikungunya? Chikungunya usually starts suddenly with fever, chills, headache, nausea, vomiting, joint pain, and rash. In Swahili, "chikungunya" means "that which contorts or bends up". This refers to the contorted (or stooped) posture of patients who are afflicted with the severe joint pain (arthritis) which is the most common feature of the disease. Frequently, the infection causes no symptoms, especially in children. While recovery from chikungunya is the expected outcome, convalescence can be prolonged and persistent joint pain may require analgesic (pain medication) and long-term anti-inflammatory therapy. Infection appears to confer lasting immunity. 8. How soon after exposure do symptoms appear? 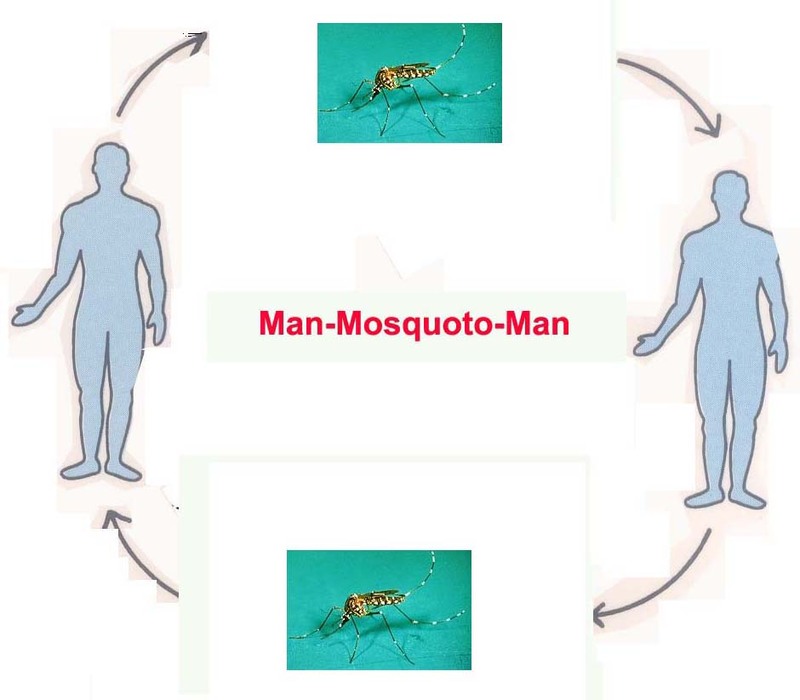 The time between the bite of a mosquito carrying chikungunya virus and the start of symptoms ranges from 1 to 12 days. 10. Who is at risk for chikungunya? Anyone who is bitten by an infected mosquito can get chikungunya. 11.What is the treatment for chikungunya? There is no specific treatment for chikungunya. Supportive therapy that helps ease symptoms, such as administration of non-steroidal anti-inflammatory drugs, and getting plenty of rest, may be beneficial. Infected persons should be isolated from mosquitoes in as much as possible in order to avoid transmission of infection to other people. 12. How common is chikungunya globally? 13.How can chikungunya be prevented? When indoors, stay in well-screened areas. Use bed nets if sleeping in areas that are not screened or air-conditioned. When working outdoors during day times, wear long-sleeved shirts and long pants to avoid mosquito bite. 14.How can Aedes mosquito breeding be controlled? By elimination of all potential vector breeding places near the domestic or peri-domestic areas. Not allowing the storage of water for more than a week. This could be achieved by emptying and drying the water containers once in a week. Straining of the stored water by using a clean cloth once a week to remove the mosquito larvae from the water and the water can be reused. The sieved cloth should be dried in the sun to kill immature stages of mosquitoes. Where the water cannot be removed but used for cattle or other purposes, Temephos can be used once a week at a dose of 1 ppm (parts per million). Pyrethrum extract (0.1% ready-to-use emulsion) can be sprayed in rooms (not outside) to kill the adult mosquitoes hiding in the house. Like introduction of larvivorous fish, namely Gambusia and Guppy in water tanks and other water sources.